Actually, I only realized it was May Day this morning. It's frightening how poorly I keep up with stuff like this. Must be because my calendar is categorized only into Weekends, Driving To School days, and Days To Recover From Driving To School. 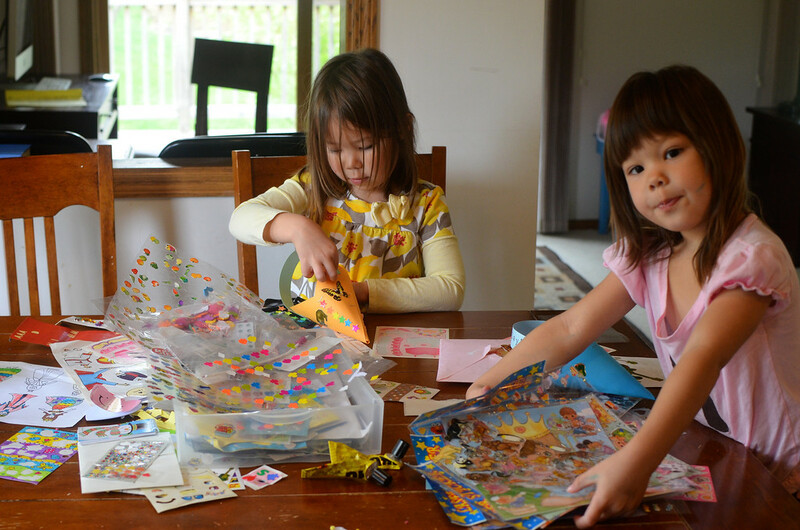 Anyway, so at about 745 am, I decided maybe we should make some May Day craft-type things. and made little cones. It was a very fast project- we stapled everything together and then did sticker embellishment. 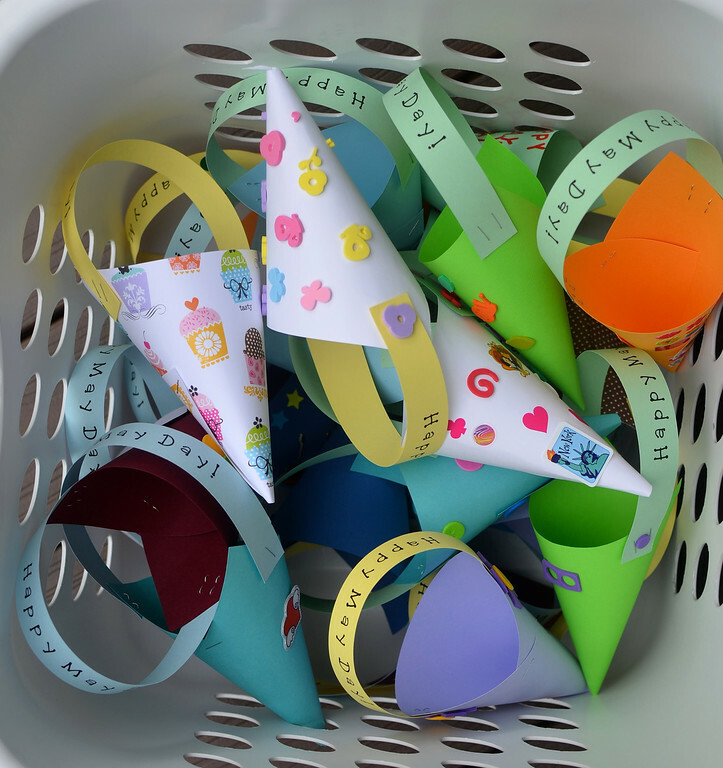 Our initial plan to make just six cones for our immediate neighbors exploded into a mass-production effort to supply all the girls' preschool classmates (albeit a day late) with baskets of their own. It is a good thing we aren't in short supply of stickers, since we really used them. 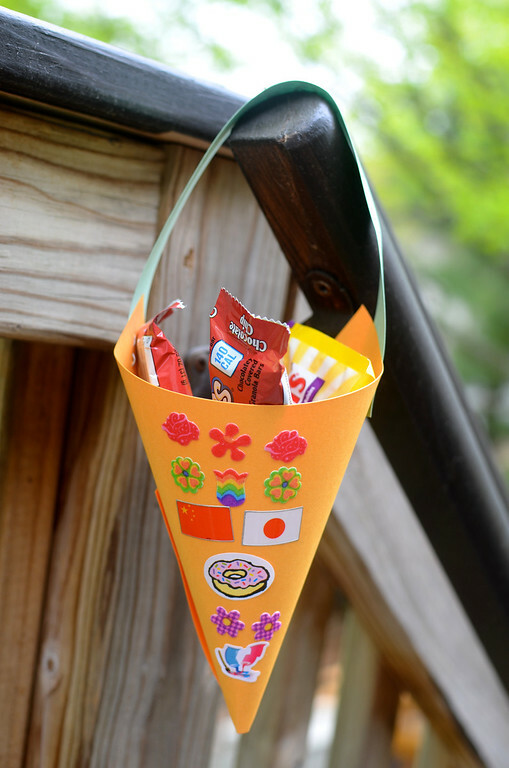 After lunch we're heading out to Target to buy more treats to fill the cones, and then we're heading out to ring some doorbells. If this post sounds manic and emergency-like, it is, because the sky is threatening to rain this afternoon, and we're aiming to be out and be done before that happens. Wish us luck! P.S. If you're a neighbor who also happens to be a blog reader (that means you, K! ), pretend you didn't see this post, OK? I need to work on our sticker collection. And I hear you about Recover From Driving to School Days. I am SO excited for summer vacation, even if it is still nearly two months away! Fantastic! I wish I was your neighbor! :) I think the last time I saw a May Basket when I was about their age! Perfect! I ran around my tiny town all morning lookin for cellophane to put some of these together and failed. I like yours better anyway! You're so funny, L. And how did you guys manage to come during the fifteen minutes I was out getting Lucy from school? Sorry we missed you, but we all enjoyed the treats. And one of our neighbor girls who was over at the time mentioned that she'd never gotten a May basket before. So a while later, Sophie filled up your basket and hung it on her door. (She could hardly believe it when I said she could ring the doorbell and run away. 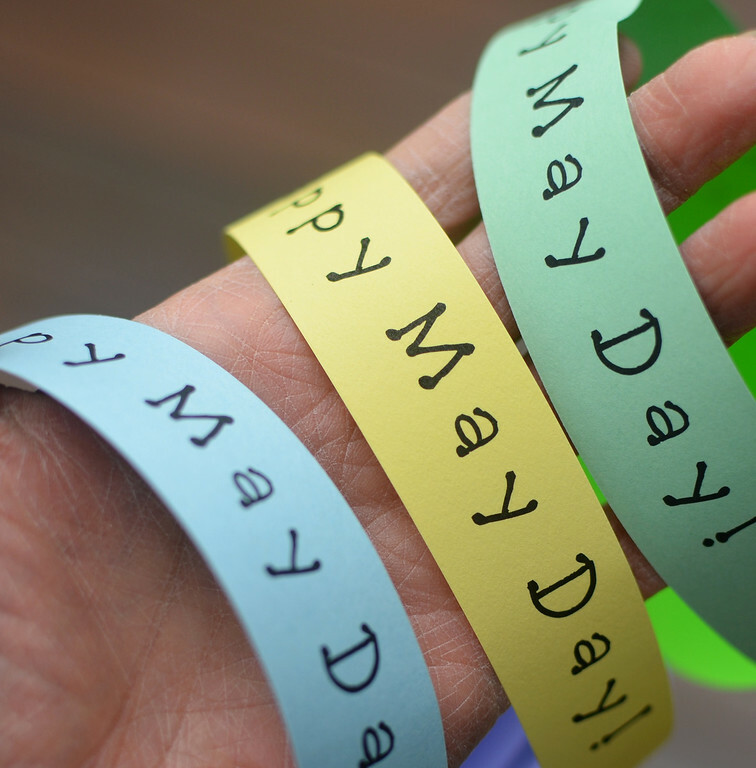 Is that correct May Day etiquette or are you supposed to wait? ) Anyway, thought your girls might enjoy hearing about the basket's second life. What happened to ring the doorbell and run -- at dawn! We used old manila folders (B.C. (before cardstock)). Cut 1" off the long side for the handle and roll the remainder into a cone. 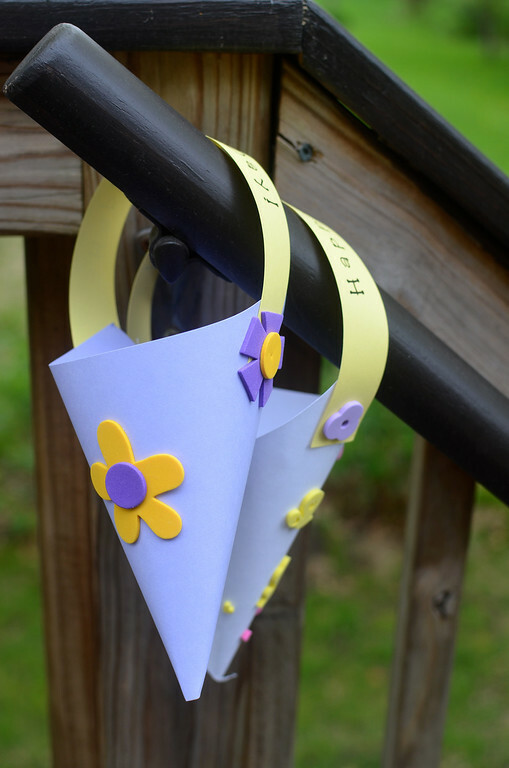 Staple handle on and fill with Spring flowers. oh! a wonderful idea for my little reading group. So cute! I haven't remembered May Day in time to do baskets in years. Last time we did it we bought 4-packs of pansy plants and added handles. BTW, I linked to your Geek Shirt post today, hope you don't mind!